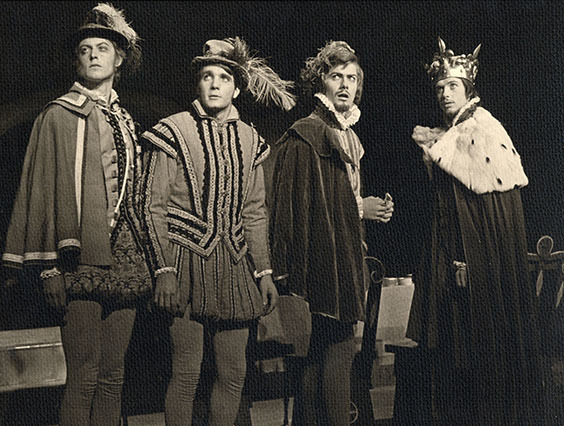 Alumni Photo from the performances of the 1968-1969 academic year. Please join us for performances by the Mermaid Players and the Dance Theatre Group. To see our current schedule of Upcoming Performances, please clink on this link. We look forward to seeing you soon! David F. Brubaker, known affectionately to thousands of Dickinsonians and Mermaid Players simply as "Mr. B", passed peacefully from life's stage on May 29th, 2002. A memorial service in celebration of his life and career was held on June 6th, 2002 in the theatre that he built along with his wife Marj Green Brubaker. Please note "Brubaker Scholarship Fund" on your contribution. Scott McPheeters and Sara Nye recently collaborated on a production for the Philly Fringe Festival titled “Chick.” Scott also continues very actively in the Philly dance scene, having recently performed with the Nichole Canuso Dance Company. Kim Kalish produced an Equity Showcase production on Theatre Row (Samuel Beckett Theatre) of Songs for a New World. The production benefited the Patrick Michael McMurphy Memorial Foundation. She is taking Improv classes at Upright Citizen's Brigade and is heavily involved with a sketch group called "The After School Specials". Kim also reports that Andrea Schwartz is currently splitting her time between Baltimore and New York. Both Kim and Andrea are working on a web series, and Ellen Joffred is on her way to New York. Kris Mioskie performed in "Don't Tell Mama's in the Cabaret." Speaking of New York, Andy Kirtland has relocated there, and has landed a staged reading as well as a day job with the Baseball Foundation. He is also continuing to act with the New England Shakespeare Festival. More recently, he performed in "Macbeth", playing Banquo and the Doctor, among others for the Stella Adler Studios. Rick Fisher was the toast of New York as he received his second Tony Award, this time for the lighting of Billy Elliot. Across the river, Midge McCoy is teaching theatre classes in New Jersey and also works at the Hartford Insurance Company. Sarah Gafgen continues to add roles to her resume, recently as Annie Oakley in the Ptittman Broadway Theatre’s production of Annie Get Your Gun. She also works extensively with Philadelphia’s Hedgerow Theatre. More recently, she has been involved in the "Philly Theatre." Janet Zarecor, Josh Sherman and their Impetuous Theatre Company keep making waves and headlines in New York. Vlad Olievschi recently relocated to Europe where he is working with the European Bank for Reconstruction and Development. Michael McElroy '09 is currently working at the "Arden Theater" in Philadelphia, a little acting, box office and teaching drama classes to children. Andre "Dre" Herbert '10 has worked with the Orlando Shakespeare Festival after spending the summer working in a Theatre in Maine. More recently, she was the production manager for a play festival in Brooklyn, stage managing "Ragtime" the musical with a cast of 50 in North Carolina and she was stage managing the first show of "The 39 Steps". Tiffany Kintigh '10 has worked with Tempe Center for the Arts in Tempe, Arizona as House Manager and with ASU Gammage in Tempe, Arizona as Floor Manager. Brie Hines '11 and Lindsay Anderson '11 were featured during the Philadelphia Fringe Festival, as well as Shamus Hunter McCarty '11 for design. The three are co-founders of Hyphen-Nation Arts. In addition, McCarty '11 was the Assistant Director and Designer for the Summer Theatre of Meredith Village, Assistant Director for the Flashpoint Theatre Company, and is designing for Wolf Performing Arts Center as well. Kathryn(Kat) Rother '12 worked with Director Noah Tuleja, a previous adjunct Professor of Theatre, on a show during the Fringe in NYC. Layla Meyer '13 worked for Anneliese Von Oettingen School of Ballet teaching Ballet l, Ballet ll, Int/Adv Ballet with Pointe and Modern Dance to students ranging in ages 4 to 25. Also, Layla has assisted an Artist Director with the choreography for several ballet pieces. Lauren Brennan working as Costume Adjunct Faculty in Spring 2018 at Dickinson College. She is designing the Mermaid Players performance of Clybourne Park.